I finally looked up the number of adaptions there really are to Dickens’ A Christmas Carol, and the number is outrageous. I guess a lot of people really consider it the best Christmas story of all time, which in a lot of ways I can appreciate. I wouldn’t say it’s the best story, but it sure is up there and always timeless as ever. Any classic story like this will have a great variation in the form of storytelling, and spoofs are simply another way of telling the same story. Who needs the same exact thing when you can kind of poke fun at different elements while making the film more modern? That’s pretty much the general idea behind Scrooged. 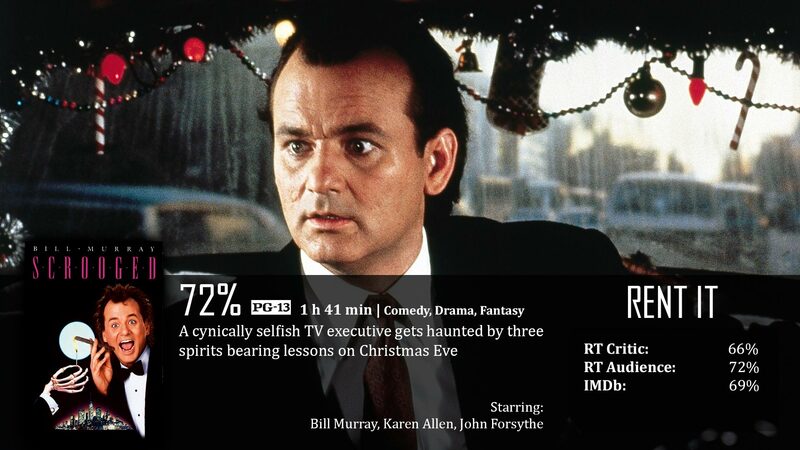 So in this adaptation, Bill Murray plays our Scrooge, a.k.a. Frank Cross, a TV executive who runs IBC (a direct poke at ABC). He wants to put on a live production of A Christmas Carol on Christmas Eve, which isn’t so bad, but the greed of his position has turned his heart into a frozen ball of ice. So what do you know it, his old boss that died years before informs him that he will be visited by three ghosts who will teach him the error of his ways while simultaneously reminding him of what was, what could have been, and what could still be. In a nutshell – it’s another A Christmas Carol. Man, the look of this film is so wacky, the first thing my mind shot to was Tim Burton, but that wasn’t it at all. No, this film is Richard Donner…which honestly is incredibly strange to me. I’m a fan of Donner’s work, and there’s always something very interesting about each of them, but man does this film not really feel like…Donner. There are things in this film that I can appreciate, but things I just ultimately didn’t care for one way or another. It’s not that the film was bad, really, it just didn’t particularly hold my interest. I complained the last time I reviewed a film based off A Christmas Carol, saying it focused way to much on the comedy and lost a lot of that dark element that the film really needed. Maybe I’m just picky, but I had more of an opposite reaction when watching Scrooged, which had plenty of darkness to it, but wasn’t light when it needed to be too. A Christmas Carol is a tale of both light and dark respectfully, not one or the other. Yeaaaa, yea, this is a spoof, but still…the same applies because this is still a tale of redemption. You can make as many dark comedic jokes as you want, that’s fine, but when it’s needed, you should be able to deliver a great performance emotionally, to which I don’t think they did. Bill Murray seemed perfect for the role, because he’s great as a sarcastic dude, but we all know how this story ends…Scrooge gets his happily ever after and is completely transformed. We’ll just say that by that point in the film…you just don’t buy it. His role switches gears from “Frank Cross” being a greedy a-hole to “Bill Murray” who just seems to take nothing seriously in the end. It’s like the script says – be merry and jolly, and he’s like…I’ll show you merry and jolly and purposely overdoes it to look stupid. It’s hard to explain, but I swear…I wasn’t impressed. Now, the tone remains consistent throughout the film, and that’s a good thing, no matter how weird the tone initially seems. They set the tone, and they grabbed the appropriate characters for said tone. The kind of Christmas Carol film that you usually see is clearly too mainstream, so if you like really strange films, this one is a winner for the holiday season. Watch it right after A Nightmare Before Christmas and you got yourself the start of a playlist. Bill Murray definitely seems to be perfectly set in place here, and he definitely makes the role his own. This is a perfect place to go if you are too tired of seeing the same old same old from this classic tale. Other films have spoofed the same story, but this is probably the most famous of all the spoofs. Personally, I wasn’t a huge fan of the film. When it comes to A Christmas Carol, it’s not that I’m a big fan of the classics, I just have standards for the story. It can be any tone, dramatic, comedic, or musical, whatever…I just believe the story needs a good balance between darkness and light…it just seems that the movies I watch focus on one, but not the other…which to me…loses the point of the entire story. Frank Cross: I never liked a girl well enough to give her twelve sharp knives.